I was really in the mood to get back to watching some slight up 80’s slashers. I wanted something fast, funny and quite a bit bloody. 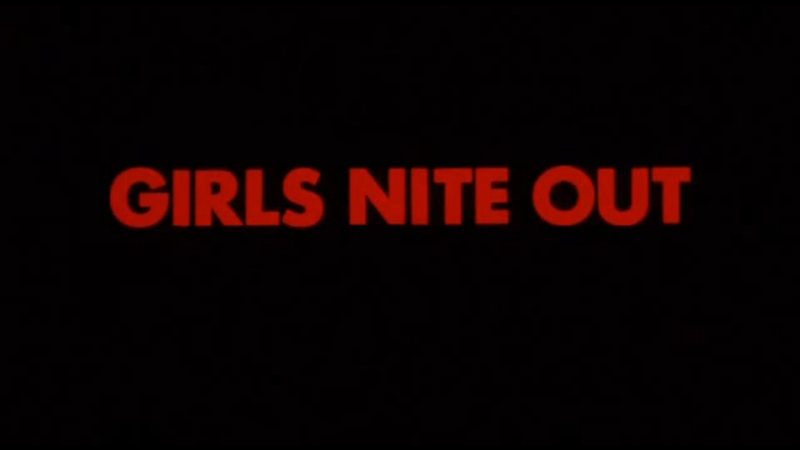 Unfortunately I got Girls Nite Out which is a hour and forty minute film that’s mostly about the “complex” relationships about a bunch of college students who are all almost identical to each other. At Weston Hill Sanitarium, a nurse is called multiple times by a patient who doesn’t reply when she answers her phone. She goes to check on him and discovers that he has hung himself in his room. The patient, Dickie Cavanaugh, was a murderer who seemingly only has his sister left as family. She allows the body to be buried, but while the grave diggers are doing their jobs, they are both killed. Meanwhile, in the work of National Lampoon, Dewitt University is celebrating winning it’s basketball game. Two of the team’s stars are Teddy and Some Other Guy. While Some Other Guy is the one who wins the game for the team, he is not essential to this plot. Though his girl did break up with him and I think I’m supposed to care. But Teddy is the real star. He and his girlfriend Lynn are supposed to be some real cute pair, but Teddy is kind of a skeezy dude who has somehow managed to hold onto a seemingly problem-free and happy girlfriend. After the game, the school is gearing up for the school’s scavenger hunt that will be occurring the next night. It’s girl-only for some reason. Probably because women are stupid and can’t compete against men or whatever. To celebrate their win, the team goes to the local diner where they all chat to their favourite waitress, Barney. Teddy and his posse are rather chuffed when the campus security officer buys them their burgers. Officer MacVey (Hal Holbrook) has a bit of a tragic past. His daughter was killed by a certain Dickie Cavanaugh years before after she broke up with him. The students move on to the golden oldies party that is taking place at one of the sorority houses that night (this is a rather swinging campus). Plenty of drama unfolds. Teddy is caught by Lynn while he is trying to gain the attention of a girl named Dawn (who is pretty much a dead ringer for Christine Taylor). Another boy, who only stands out because he’s Hal Holbrook’s son, argues with his girlfriend when he confronts her about her cheating on him with the school mascot. But Holbrook jr doesn’t have to worry because the man inside the suit is killed off and his bear mascot suit it taken. The thief then creates their own makeshift serrated-knife claws that go rather nicely with their new outfit. The following night the scavenger hunt, hosted by the world’s most irritating radio DJ, is in full swing. As each of the girls figure out one of the clues to the hunt, a girl gets killed off by the person in the bear suit. And each time, the killer calls into the radio station proclaiming their victim. I would have liked these calls to be in riddle form like the scavenger hunt, but they’re not clever enough to keep in theme. While all the killings are going on unnoticed, Officer Mac gets a call of his own saying that his daughter was a very nice girl. It’s not too long after that Lynn discovers the mutilated body of one of her friends. After the bodies are discovered, the police are called in to start questioning suspects. And yes, the film shows ALL the questioning. All of the answers are basically recaps of what has happened in the movie for the first hour or so. You know, if you’re too stupid to remember what has happened thus far. Where are our “heroes” in all of this? Well, Teddy is sleeping with Dawn. Even though he sneaks out, their little rendezvous is discovered. Dawn is thrown out of her home and is then followed by someone. In her panic, Dawn calls Teddy to come rescue her over the payphone. Teddy immediately leaves Lynn (who is still upset over seeing her friend dead) and runs to Dawn’s rescue. Somehow he manages to find her in the place she hadn’t called him from and sees her lying on the floor covered in deep wounds. With clues like “Dickie is out” and something about twins, it’s pretty obvious that the killer with be Dickie’s sister, who allowed him to be buried. And it would have to be the only slightly-older female in the movie: the waitress. And alas, Barney is out killer. She’s Katie, Dickie’s twin sister. She has a “personality disorder” that makes her behave in some sort of faux-multiple personality disorder way. She says she/Dickie needed to kill the students because the students “were bad”. And that’s it. Really. Even Officer Mac doesn’t serve much of a purpose. He figures out the culprit himself, sure, but he went to the diner that Barney worked at ALL THE TIME. How did he not recognise her as someone who looks almost identical to the man who killed his daughter? There are a lot of characters in this movie. And quite a few of them get a lot of screen time. They are entirely inconsequential to the plot. Many of them aren’t even killed. What is there purpose? To be comedic relief, I think. Maybe trying to cash in on Porky‘s while not really being funny at all (I’m looking at you two… “drama students” are whatever the hell you are). Really, I think the point was to prove that all of these students are awful to each other. But they really aren’t. They’re just kids. When Barney claims she’s killing them “because they were bad” I’m not buying it at all. Even if that was true, I’m impressed that she knows that much about their lives to begin with. Girls Nite Out is only slightly interesting for a couple reasons. Mostly it’s soundtrack, which mostly considers classic tunes (dubbed “golden oldies” throughout the movie) including tracks by Tommy James and the Shondells and The Lovin’ Spoonful. But the building of characters is worth noting, even if the film didn’t pull it off… at all. I think if it would have reigned itself in and focused on only a small handful of kids and axed the security guard story backstory, Girls Nite Out would have been a lot more effective.